ANNUAL REPORT 2016: FEED YOUR SOUL! Bay Leaf Kitchen empowers children and families with the ability to feed themselves seasonal, nourishing food through an immersive culinary curriculum to build a resilient, diverse community in the soil and around the table. IMMERSIVE LEARNING: At Bay Leaf Kitchen, worthwhile learning happens in the soil, in the kitchen, and on the plate. We facilitate spaces that incorporate play, encourage confidence, and uncover creativity and independence. Bay Leaf Kitchen develops practicable skills from farm to kitchen and beyond. SEASONAL, NOURISHING FOOD: Seasonal, nourishing food fosters a healthy lifestyle, preserves the environment, and strengthens local communities. By providing access to seasonal, nourishing food, Bay Leaf Kitchen empowers children with the ability to feed themselves; with the capacity to cook comes the opportunity to choose how to eat. COMMUNITY: Bay Leaf Kitchen builds community around the table with farmers, chefs, children, and families. By bringing people together over a shared meal, we create educational experiences and opportunity. We invest in the continued success of each child and develop tailored programming to create a more inclusive community. DIVERSITY: Bay Leaf Kitchen actively reaches and supports diverse populations within our communities. We believe every child deserves access, acknowledgment, and support. We welcome students from varied backgrounds and experiences to provide unique opportunities for engagement and continued learning. Bay Leaf Kitchen made a purposeful commitment to increase by 20 percent the number of families who benefit from core program offerings by 2016. Strategies focused on growing service to low-income families, and with the support of donors, we achieved this commitment. With our office being located in Bayview (thanks to the generosity of Andrew Casteel) and collaborating with new neighborhood partners Imprint City and MYEEP, we have strengthened our mentorship programs that engage at-risk youth ages 10 and up with Jr. Chef Helpers. 47 VOLUNTEER GUEST CHEFS-LED CLASSES, INCLUDING: CAT SHIMIZU, SOUR FLOUR, MICHELLE MINORI, BARZOTTO, TU DAVID PHU, AN AND MANY MORE! Through our core programs of Cooking Camp, Jr. Chef Helpers, and Community Dinner we positively impacted family eating habits by building trusting relationships through which families can gain knowledge and skills in food selection and preparation. Bay Leaf Kitchen’s unique approach of partnering with trusted neighborhood organizations provides a foundation for effectively empowering families to improve their diets and nutrition. In addition, our unique camp/farm program is distinctive in that it combines socialized learning and shared values in healthy food choices, resulting in campers internalizing important lessons. Children form positive connections to healthy food and gain confidence to take the experience into their homes. One of my greatest joys as a board member has been the opportunity to experience Bay Leaf Kitchen’s programming first-hand. This summer, during session three, I met two amazing scholarship campers—nine-year-old sisters. We bonded immediately those first few days of camp while exploring the Abundance Community Garden, creating “Team Tortellini” chants, and making gnocchi, granola bars, and even miso butter from scratch. Their enthusiasm for every aspect of camp was contagious; they even loved doing dishes! After learning about their backgrounds and the hardships they recently endured, I enthusiastically offered to mentor both of them. This fall, I’ve had the pleasure of taking them on adventures all over San Francisco and providing them weekly academic support. I relish this opportunity to positively impact their lives. To me, the most meaningful aspect of Bay Leaf Kitchen is the connections that are formed. I am proud to be part of an organization that provides such a special, safe, and supportive space for kids from all backgrounds and experiences to thrive. I didn't know what I was signing up for when I applied to be a CIT for Bay Leaf's cooking camp. I honestly thought it would be just another summer activity that'd look good on college applications and resumes. That's pretty much the main motive of anyone my age doing something over summer break that involves leaving the house at 8am. 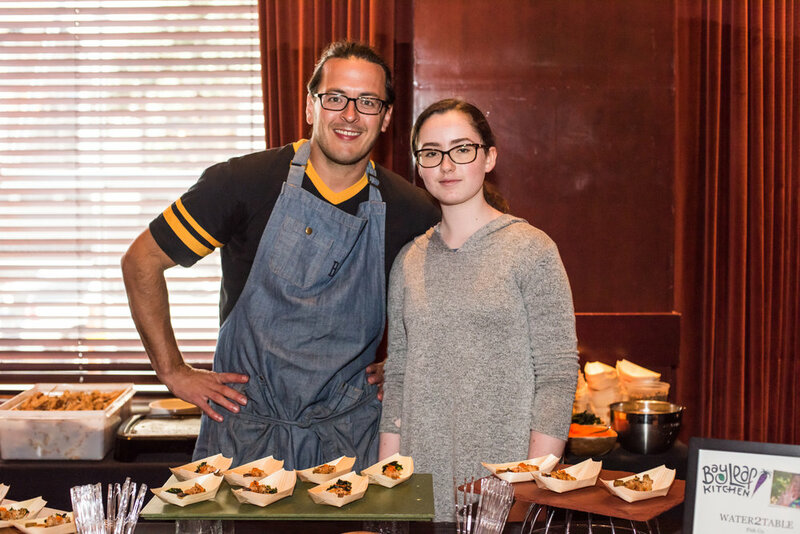 Elianna came to my after school program towards the end of spring semester, my junior year, to talk about Bay Leaf Kitchen and it occurred to me that if I was going to volunteer my time doing something over the summer, I might as well have fun doing it. It did sound like fun, but like I said, I had no idea what I was signing up for. I had no idea I was signing up for working with amazing kids from all over the Bay Area and some even coming from different states. No idea that I would be learning skills and basics along with the campers or working with and meeting top names of the city's culinary industry. No idea that I'd end up becoming a part of the program further than the four week summer camp, because I had no idea that Bay Leaf is the amazing, supportive community that it is. I'm so happy to be a part of it. Please help us ensure hundreds of Bay Area families can continue to have the transformative experiences that Bay Leaf Kitchen provides. Your donation goes directly to our core operations and scholarship program, helping us achieve our goal of never turning away a child who wants to learn, regardless of their family’s economic status or background. Please consider the option of a monthly sustaining donation as it allows us to focus on long-term planning. We encourage you to join our online community! Please share your Bay Leaf Kitchen cooking experience — a recipe, helpful cooking tip or encouraging words on how to cook and eat healthfully in 2017 — via email or social media. Like us on Facebook, Instagram, Twitter, and Pinterest. Contact info@bayleafkitchen.org for a complete list of opportunities including farm and hands-on kitchen experiences. Thank you for being a part of the Bay Leaf Kitchen family! Our wonderful programs exist because people like you recognize that it is ultimately up to us to ensure that children learn to enjoy healthy food at an early age.